Cities all over North America are getting excited about the fact that Amazon is looking for a second HQ. With bids due this week, many of them are using marketing campaigns to lobby the retail behemoth to bring its 50,000 jobs and $5 billion investment--and although winning will not come down to a creative campaign, the cities are having fun with it. 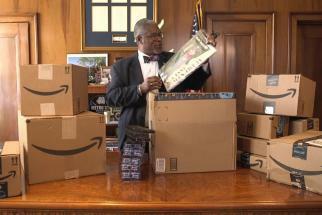 Take Kansas City, Missouri, which, via local agency Barkley, has had the bright idea of getting its mayor, Sly James to write product reviews on Amazon which hype up the benefits of his hometown. James and his staff purchased a thousand items on Amazon.com and wrote five stars product reviews of items like Wind Chimes (seen here), a horse backpack and a toddler's train engineer costume. All cleverly find a way of tying in with some aspect of Kansas City's many qualities; for the wind chimes, it's the low house prices. 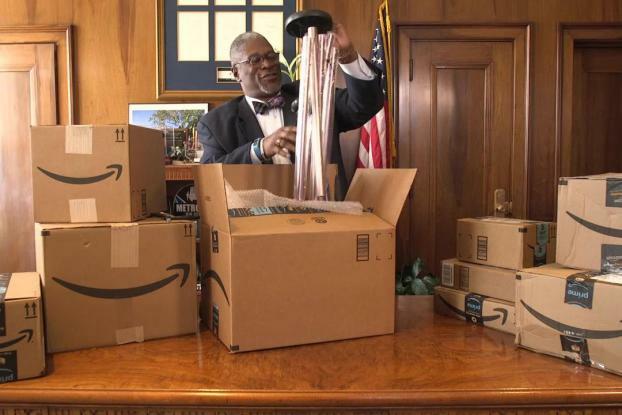 A team of writers taking on the voice of Mayor James wrote more than a hundred reviews for all thousand products ordered -- and in some cases, he bought as many as 25 of each item. Other fun campaigns include that of Birmingham, Alabama, which, in a campaign by agency Big, has created two oversized Amazon Dash-like buttons that when pressed automatically send one of hundreds of pre-developed tweets through @BringAtoB. Meanwhile New York Mayor Bill de Blasio turned some of the city's most iconic buildings orange in its effort to woo Amazon. Calgary, Canada is also getting in on the act with a campaign through Critical Mass that includes both videos and large-scale billboards and street art written in chalk plastered all over Seattle. One of the billboards is placed directly outside of Amazon's downtown corporate office with the words: "Hey, Amazon. Not saying we'd fight a bear for you... but we totally would."